Wednesday, January 16, 2013 ratings — New episodes: American Idol, The Middle, The Neighbors, Modern Family, Suburgatory, Nashville, Criminal Minds, CSI, Arrow, and Supernatural. Episode reruns: NCIS, Whitney, Guys With Kids, Law & Order: Special Victims Unit, and Chicago Fire. 8pm – The Middle: 2.3 in the demo (-4% change) with 8.20 million. 8:30pm – The Neighbors: 1.9 in the demo (-10% change) with 6.17 million. 9pm – Modern Family: 4.3 in the demo (-9% change) with 11.02 million. 9:30pm – Suburgatory: 2.4 in the demo (-8% change) with 6.35 million. 10pm – Nashville: 2.2 in the demo (+5% change) with 6.54 million. 8pm – NCIS: (rerun) 1.1 in the demo with 8.38 million. 9pm – Criminal Minds: 2.8 in the demo (-10% change) with 12.53 million. 10pm – CSI: Crime Scene Investigation: 2.3 in the demo (+5% change) with 11.10 million. 8pm – Arrow: 1.1 in the demo (+10% change) with 3.13 million. 9pm – Supernatural: 0.9 in the demo (0% change) with 2.07 million. 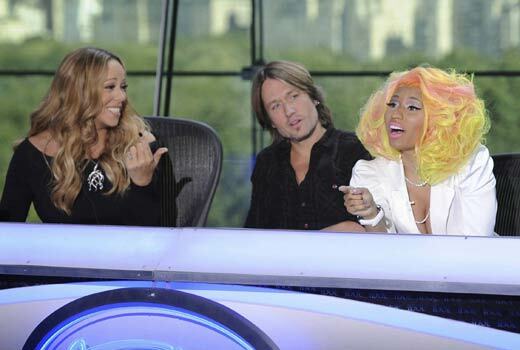 8pm – American Idol: 6.0 in the demo with 17.80 million. Year-to-year, the premiere was way down — vs a 7.4 demo rating and 21.93 million total viewers. 8pm – Whitney: (rerun) 0.8 in the demo with 2.66 million. 8:30pm – Guys with Kids: (rerun) 0.8 in the demo with 2.35 million. 9pm – Law & Order: SVU: (rerun) 0.6 in the demo with 2.73 million. 10pm – Chicago Fire: (rerun) 1.0 in the demo with 3.45 million. What were you watching last night? The season premiere of American Idol or perhaps the returns of Arrow, Supernatural, Criminal Minds, or CSI? Something even better? I was watching SUPERNATURAL – the best tv show ever.